During the dark night of Soviet totalitarianism, holy men and women shone like stars throughout the many lands that comprised the U.S.S.R. One of these was Elder Vitaly (Sidorenko). (1928–1992). Born in the Russian region of Krasnodar, in his youth he was a novice monk at the Glinsk Hermitage in Ukraine, where he was spiritually formed under the guidance of holy elders. Due to Communist persecution he was compelled to leave Glinsk, becoming an ascetic pilgrim and traveling from one holy place to another. Finally he settled in Georgia, which was also under Soviet rule, and in which the elders and some of the monks of Glinsk had made their home after their monastery had been forcibly closed. In Tbilisi, Georgia’s capital, Fr. 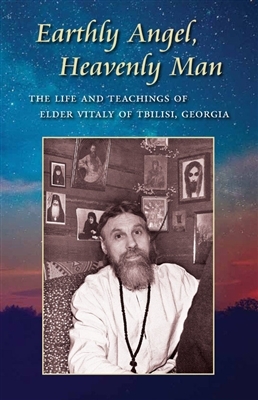 Vitaly served as a priest under Metropolitan Zenobius, a holy hierarch-elder who himself had been a monk at Glinsk. Living in obedience and humility, practicing strict asceticism combined with continuous prayer, and exercising his heart in the commandments of love for God and neighbor, Fr. Vitaly became a holy elder like his preceptors. Granted by God the gift of clairvoyance, he could see into people’s hearts and discern their past and future, in order to guide souls in the way of salvation. For decades he nurtured the people of Tbilisi with his enlightened, fatherly counsel. His love was truly sacrificial, for while enduring physical infirmities and deprivations he never spared himself in his pastoral labors. Living beyond this world, Elder Vitaly was truly an earthly angel and a heavenly man.